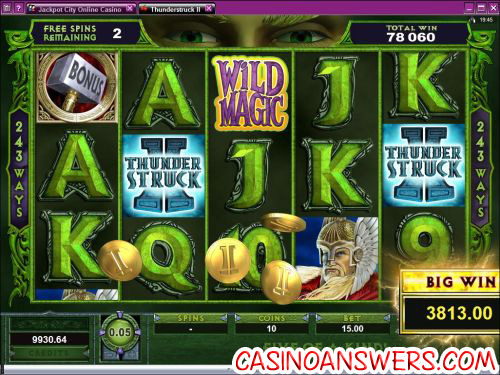 Thunderstruck II Video Slot Guide & Review - Casino Answers! Thunderstruck II is a 5-reel, 243-way video slot from Microgaming featuring scatter wins, wild substitutes, expanding wilds and four unique free spin features. You can play Thunderstruck II at All Jackpots Casino and Jackpot City Casino. Thunderstruck II, obviously, is the sequel to the popular Thunderstruck video slot from Microgaming. Like its predecessor, it has a Norse God theme, featuring Thor, Odin, Loki and Valkyrie. When you start Thunderstruck II, you are shown a very well done intro movie where Thor uses his hammer to bust up a rocky cliff to create the Thunderstruck II logo. Thunderstruck II is a unique and perhaps very innovative video slot. Instead of using paylines, the Thunderstruck II video slot boasts 243 ways to win. Way wins are awarded for left to right adjacent symbol combinations. To start playing Thunderstruck II, you must first select one of the three coin values of $0.01, $0.02 and $0.05. Next, you can choose between 1-10 coins. Each coin is worth 30X your coin value, so the minimum bet on Thunderstruck II is $0.30 and the maximum bet is $15 per spin. Once your bet is set, you can hit “Spin” or “Bet Max” to start playing Thunderstruck II. Thunderstruck II’s Wildstorm feature will randomly be triggered. It can turn up to 5 reels into expanding wilds. Free spins cannot be triggered during the Wildstorm feature. 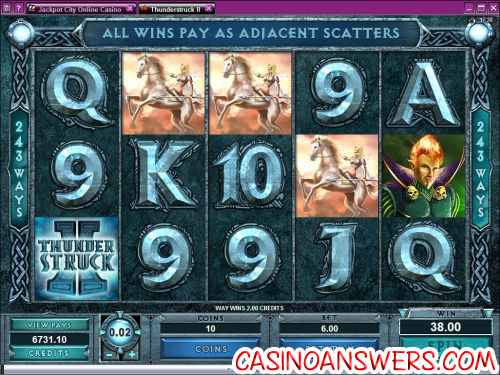 During this feature, you get the maximum win on the Thunderstruck II slot machine of 2,400,000 coins. At the highest coin value of a nickel, this works out to $120,000. The top jackpot during the regular Thunderstruck II game is the Thunderstruck II logo, which is the wild symbol. 5 Thunderstruck wild symbols will win you 1000 coins. It substitutes for all symbols except for the bonus symbol and acts as a 2X multiplier. This means that the wild symbol will double your winnings. The Thunderstruck II symbol is not wild during the Wildstorm feature. Thunderstruck II has a progressive free spins feature called the Great Hall of Spins. For each time you trigger the free spins, you will get closer to unlocking a new feature. To trigger the free spins feature, you must have 3 or more Bonus Hammer symbols appear on a spin. Every time you enter the free spins feature, you will have the choice of any of the free spins features you have unlocked. Each feature has its own look and music that plays for the duration of the feature. The game will save your progress, so you don’t have to worry about losing your spot when you decide to stop playing Thunderstruck II. The Valkyrie feature will be enabled on the first trigger of the free spins bonus feature. You will receive 10 free spins with a 5X multiplier. Free spins can be re-triggered. The Loki feature will become available on the fifth trigger of the free spins bonus feature. You will win 15 free spins with the Wild Magic feature. The Wild Magic symbol will appear on the third reel and will randomly transform symbols into additional substitutes. 2 or more Bonus Hammer symbols will trigger up to 4 additional free spins. The Odin feature will be available on the tenth trigger of the free spins bonus feature. You will win 20 free spins with the Wild Raven feature. Odin’s Ravens can randomly turn symbols into 2X or 3X multipliers. You can win a 6X multiplier if both Ravens land on the reels. The Thor feature will be enabled from the fifteenth trigger of the free spins bonus feature. You will win 25 free spins with Rolling Reels. Consecutive wins will increase your multiplier from 2X up to 5X. Rolling Reels can award multiple consecutive wins. As you can see, whenever you receive a big win on Thunderstruck II, a box will pop-up displaying your total win and gold coins start to scatter on the screen. Here’s hoping you get to see this for yourself! Wins using the Bonus Hammer symbol are multiplied by the total bet staked. All wins pay left to right except the Hammer symbol, which pays any. Way wins pay according to the paytable multiplied by coins bet. Feature wins will be added to triggering wins. Change the Thunderstruck II video slot from Regular mode to Expert mode and you can use its autoplay feature. You can set the number of spins (from 5 to 500) and to stop if a win exceeds or equals an amount (from $100 to $9999). You can also use quick play 5X and 10X autoplay buttons if you don’t wish to add any stop conditions. You can always cancel the autoplay feature at any time. Thunderstruck II is a vast improvement over the original Thunderstruck video slot, which is to be expected as the first game is quite a number of years old by now. It has excellent graphics, music, sound and animations in addition to its very unique and original gameplay and many different special features. It’s definitely a video slot we recommend you try, because there’s not really anything else like it. If you want to play the Thunderstruck II video slot for real money, we suggest you take advantage of the 100% up to $200 signup bonus offered at All Jackpots Casino! Are players from the United States able to play the Thunderstruck 2 slot? No, online casinos powered by Microgaming are not accepting players at this time. For some very innovative and interactive video slots that are US-friendly, try playing the iSlots at This is Vegas Casino. Can I play the Thunderstruck 2 video slot on my mobile phone? While you can’t play the Thunderstruck II slot on your cell phone at the moment, you can play the prequel on your mobile device. For full details and a 150% signup bonus, see Jackpot City Mobile Casino. Does Thunderstruck 2 have a progressive jackpot? While Thunderstruck II does not have a progressive jackpot, you can win up to 2,400,000 coins playing the game. On the highest coin value of $0.05, this converts to $120,000. Where can I play the Thunderstruck video slot machine? ﻿Nothing notable happened on this day in the gambling world that we know of. If you have any suggestions, please send them to site@casinoanswers.com.